1. Have a Disney Halloween throwback marathon of all my favorite childhood movies. And if you want you can do it with friends while baking or crafting. 2. Go to a pumpkin patch , I know this is kind of cheesy but I really want to take pictures in the pumpkin patch. And also go through a corn maze and pick out pumpkins. Here in Arizona we have an Apple Annie's and during the fall they have a variety of fall festivities going on. 3. Get into the habit of reading more, I feel like majority of the time I spend way to much time on my cell phone or to much watching tv. Its a nice treat every once in a while, and I feel like reading help you to be intellectual because you are learning new words. 4. Go for evening walks, I want to force myself to take time and enjoy the beauty of nature especially during the fall when the weather is so crisp. 5. Bake more, I think its the perfect time to whip out your baking pans and make breads , crumbles, cookies, and pies. I love to go on pinterest for inspirations and recipes. 6. Carve a pumpkin , I love to express my creativity and carving a pumpkin is a unique way of doing that. This year I probably will freehand a design for my pumpkin. 7. I want to push myself to get into the habit of studying, especially since I will be taking nursing classes next semester. 8. Go Black Friday shopping and hopefully find good deals. I still have to buy Christmas presents for my sibling and mother. This year my mom decided that we buy our gifts throughout the year , so by the end of the year each person should have twelve gifts from each other. I know these may seem a bit cheesy for a fall bucket list and aspiration , but they are goals I want to achieve by the ending of fall. 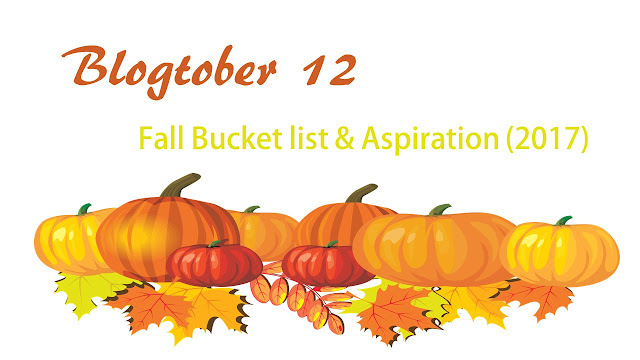 Comment down below your fall bucketlist and aspirations.